How are we doing? Read what others have to say. We really appreciate the testimonials! Send us yours and we will put it up here! 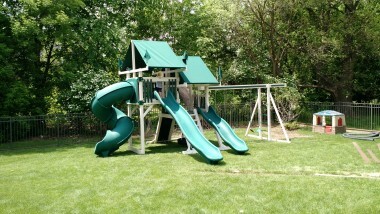 For more pictures of recently installed structures please visit our Facebook Page. On behalf of Make-A-Wish Michigan, thank you for making Alexy’s wish for a log cottage come true. She loves it. It was a pleasure working with you and I hope to work with you again on future wishes. Thank you for making dreams come true! I’m delighted with the purchase. And what a treat meeting your dad. He seems like a real gem, and you represent the family business admirably. If you have a customer seeking a reference, send them my way!! Thank you for the great job on the shed. Second shed you have done for me and both jobs were AWESOME. I would recommend to anyone at know who needs a shed. Very happy with our new Swing Kingdom Play Set. From design, pricing to final installation the folks at Jim’s Amish were great to work with and the communication through the entire process was very very good! I highly recommend this company! We’ll be buying more cool stuff very soon! These have really worked out well for us – we’ve had some pretty rough weather since these were installed and not a bit a damage to either. These things are ROCK SOLID and very high quality. Thanks again guys! Love our shed from Jim’s. This is our 3rd summer and we get a ton of compliments on it! It certainly fits great in our yard in South Lyon, MI. Thank you so much! We also wanted to let you know how wonderful the ship looks and how popular it is already. Thank you so much for working with us on this project. Your cooperation with all of our “requirements” was greatly appreciated. You helped make this a perfect addition to our Park. Thank you again. Jim & James, Thank you so much for all the hard work you did with Colin. It was greatly appreciated! I want you to know how pleased we are with our new building. It really exceeded out expectation. The building was placed with great care and precision by your dad and he did so in record time. I think he must have done one or two of these before. The people that have seen it have ask where we purchased It so I hope that this might bring you a bit more business. 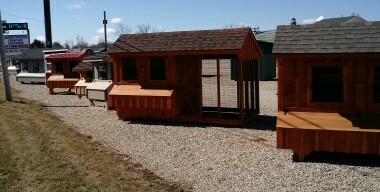 I really, really like these (chicken) coops. Like I said, the one I already have is 4 years old and it still looks brand new. The Amish DO really know how to make things. If you ever need a testimonial to how great these coops are, I’m your person to turn to.